Aggressive buying on Thursday put the markets in good position to kick-off September trading, and the outlook has regained uptrend status. There are still reasons for concern, so we’ll look to this week’s trading action for more concrete direction. In the US, the weeks starts with the markets closed for Labor Day. 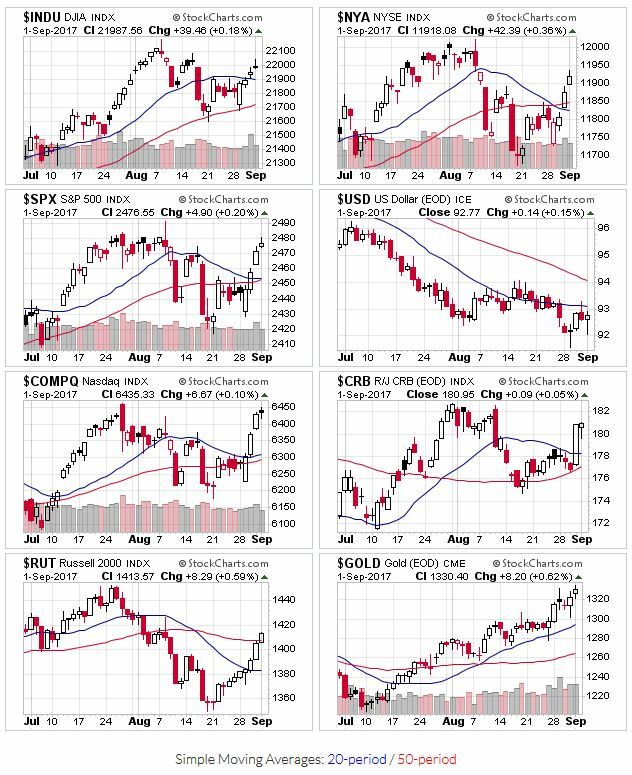 All the indexes begin this week above their 20 and 50 day moving averages. Even the Russell 2000 joined the party, bouncing back from it’s recent weakness and climbing out of bear market territory. OEW shows the market at an inflection point, so we could see prices go either direction. I’ve tried to be definitive this year (uptrend or downtrend), but there really isn’t’ a clear direction from OEW right now. We just have to watch price action unfold. Typically, this week also marks the end of summer vacation season; hopefully we’ll see a return of trading volume. As mentioned last week, September is a notoriously weak month in terms of return. Combine these traits, and I expect the markets will cross their moving averages a few times, meaning we’ll likely see changes between uptrends and downtrends as we work our way through the month.